Vice Premier Han Zheng on Wednesday met with a delegation led by Ho Iat Seng, president of the Macao Special Administrative Region (SAR)'s Legislative Assembly. 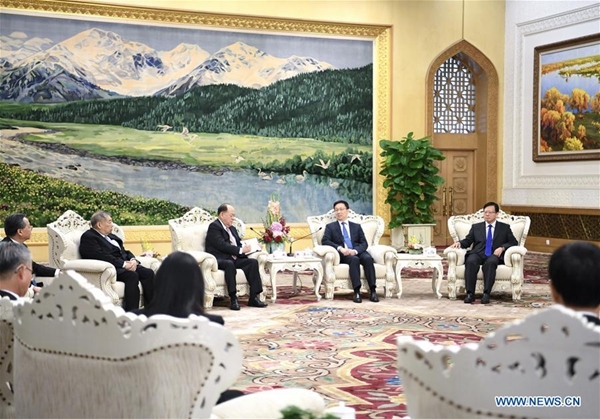 Han, also a member of the Standing Committee of the Political Bureau of the Communist Party of China (CPC) Central Committee, met the delegation at the Great Hall of the People. Han listened to a report and expressed his recognition of the work of the assembly. Han expressed hope that the assembly would conscientiously implement the important instructions on the work of Macao made by Xi Jinping, general secretary of the CPC Central Committee, fully and faithfully implement the policy of "one country, two systems," and resolutely safeguard the authority of the Constitution and the basic law of the Macao SAR. He also hoped the assembly would firmly safeguard national sovereignty, security and development interests, support the chief executive and government of Macao SAR in exercising law-based governance, give full play to its advantages in contacting with people from all circles and help promote Macao to integrate its own development into the overall development of the country. Ho pledged Macao SAR's Legislative Assembly will better fulfill its duties as mandated by the basic law and make due contributions to maintaining long-term prosperity and stability in Macao and the advancement of the undertaking of "one country, two systems."